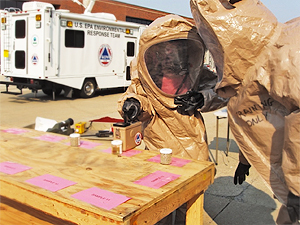 CSS supports the Environmental Protection Agency's (EPA) Office of Emergency Management (OEM) National Decontamination Team (NDT), located in Erlanger, KY. The NDT is EPA's technical expert team for responding to and preparing for chemical, biological, radiological and nuclear (CBRN) incidents. CSS staff work on technical issues related to the decontamination of buildings, building contents, public infrastructure, indoor environments, agriculture and the associated environmental media (air, soil, and water) in the aftermath of a weapons of mass destruction (WMD) event or other catastrophic Incident of National Significance (INS). Our experience covers the range of contaminants from oil to CBRN agents, and we routinely deploy conventional measurement and monitoring devices, both within buildings and outdoor environments, as well as cutting edge technologies such as ASPECT. CSS has supported EPA's Office of Emergency Management; all ten EPA Regions; Office of Water; Special Teams; Emergency Response Technical Group; and the National Homeland Security Research Center (NHSRC). CSS has also provided technical support to the Department of State and the U.S. Department of Agriculture (USDA) under this contract. Two specific examples are: a fumigation emissions study for the NDT, NHSRC, National Rendering Association and the USDA; and a project for the Department of State, where we conducted a vulnerability threat assessment and developed CBRN Emergency Response Plans for several buildings in Washington, DC.